We are offering six classy custom made dress shirts for men with two matching neckties from our premium collection range at unbelievably low prices. This on-sale package offer includes garments made with cottons, silks, wools, and different other fabrics and colors that you choose. The men's made to measure business shirts by us are stunning slim fit or comfortable formals with patterns and features like, executive stripes on white, lactose pattern, bankers stripes on white, tri color stripes on white, pastel color stripes on white, contemporary design pattern, narrow stripes, dotted Euro stripes on white, tone on tone diamond pattern, modern micro tattersall check on white, frosted Balkan checks, Oriental stripes on white, placket front, flat front, fitted armholes, hand pressed notch lapel collars, welt pockets with flaps and buttons, squared bottom, rounded bottom, and many other options. 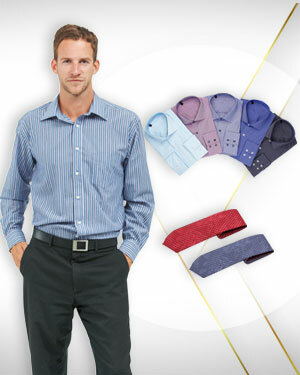 Our business shirts look exquisite with men's tailor made dress pants with flat fronts and slim cut. You can also pair formal dress shirts from this package with men's custom made denim jeans and bespoke sports jackets for semi formal gatherings. The neckties that we offer are necessary accessories to complete your formal look. Contact best bangkok tailor to know more about the intricate details about the fabrics we use and styles we offer.